Berrak Tüzünataç, born the 2nd of November, 1984 in Yalova, Turkey is an award-winning Turkish actress who came to audience attention for playing the character "Vahide" in Yılmaz Erdoğan's hit series Elveda Rumeli about Turks in Macedonia when the Ottoman Empire lost its European land. She was 11 years of age when she and her family moved to İstanbul in 1995 and attended Koç School. In 2004, she began studying Business Administration at Istanbul University. She worked as a presenter on Number One TV. She joined a model agency and took acting lessons at the BKM workshop. In 2010, she studied acting and directing at the Prague Film School. Tüzünataç made her acting debut in Beyza'nın Kadınları. She is managed by ID - a PR and Media Relations and Social Media Consultancy Service in Istanbul. 34-year-old Berrak Tüzünataç was born in Yalova. It is because of her long legs, cool looks and beautiful eyes that she overwhelms and fascinates men. Although she is said to look like she is angry, she claims otherwise. In 2005	she appeared in Beyza'nın Kadınları and Organize İşler. In 2009 she appeared in the films Ejder Kapanı and Kıskanmak	Mükerrem. The next year in 2010 she was cast in	Bir Avuç Deniz and in 2013 was appeared in Çanakkale: Yolun Sonu. In 2015 she was in Black Horse Memories	as Zaria and during 2016 she filmed Tschiller: Off Duty. On television her roles were in Ödünç Hayat in 2005 and Affedilmeyen in 2007. From 2007 to 2008	she appeared in Elveda Rumeli as	Vahide and in 2009 she was cast in Bu Kalp Seni Unutur'mu playing Yıldız Akay. From 2010 to 2011 she appeared in Ezel and in 2012 in Son. From 2013 through 2014 in Muhteşem Yüzyıl and in Galip Derviş in a guest role playing Leyla. In 2015 she appearted in Filinta as Farah and from 2017 to 2018 and in Fi as Ozge. During 2018 she was cast in Dip as Ekin. Your friend Özge Özpirinçci, in an interview in June said she made yoga a part of her routine. Did you have anything to do with that? "I'm a little campaigner. If I really believe in something, I'm sure I'm selling this idea until the end. Many of my friends have started yoga with me because I'm so sure that there's something good for everyone." "Your first course is in changing your emotions. Then you're becoming meditative. It's a great thing to experience 'being in the moment'." "I started in a time of crisis like every major change. Unfortunately, people need a vehicle in such periods. But, you don't have to be in a crisis to start something like this." "I hope we can turn into people who don't need it. When we make nice changes in our lives without such periods of unhappiness, I think we will no longer have a crisis. Not impossible, but hard." "Yeah, I started them both at the same time. Meditation has a scientific reality. When I go to the universities for an interview, I talk about meditation and offer them articles on this subject. Meditation has many scientific proofs. People perceive this as something mystical, however, there are scientific experiments on meditating people." "Meditated and non-meditated brains were examined. In the basic sense, the shift of the brain into the center of 'I' pushes us to perceive everything personally. Meditation balances it. And this is something everyone can and should learn..."
"Many think this is about concentrating more on their job, but actually, it's not. There are many different techniques. Everyone can find out what's best for them. It takes time because we learned so many bad habits in adulthood. In fact, if we learn in childhood, everything would be easier." "After I started yoga, I went with a yoga instructor to a Dalai Lama conference in Milan. They had great ideas about his education system at the conference. The love that must be taught is the most, the understanding of compassion, however is not taught in schools." As a matter of fact, if you are what you are doing, your relationships are moving as well. Our life is like our wedding. That's why I think the change in everyone's life is reflected in their own life. We always need to look at ourselves first. I want to tell everyone about something that is good and accessible, because I feel as if I have a duty to share what is so useful to me. I know that even if it reaches a person, it will spread like a butterfly effect. Fi is her new series project and it has gone crazy viral. Within 50 hours of the first three episodes being aired, it reached 3.5 million viewers. The first 9 episodes reached 50 million viewers. According to statistics that were collected by various Turkish agencies, among the 48 million Internet users in Turkey, currently the number of users watching Fi is 10 million people. "We all learned the characters from the novels. The books were our biggest source. Azra Kohen ctreated the neuropsychologist and the characters are incredible. You can see all the characters as three-dimensional. This was a big advantage for all of us. Of course, as in every book adaptation, sometimes the story leaves the book. My character, Özge, thrilled me when I first read her character. I was very excited that it was very rare for such a non-mold female character mix. I saw this as a great opportunity. Basically as a player, your promise is to build empathy. You say, "I know this character best." I am a person who can empathize. I tend to understand people even in the most absurd. Characters that are easier to understand from outside than outside, make it more demanding for defense. Özge is such a character. I find it amazing how she likes it. Because a girl who does nothing to be loved. The mouth is broken, constantly in high emotions and reactions. She can't find any quiet. Your self-confidence, your self-esteem, your faith in yourself, everything affects your performance. The harder you are, the more you can open yourself in acting. The team and the director are also very important. For example, I call myself a director. According to the director, my performance is changing. So there are many factors affecting the development. The communication with Director Mert Baykal at Fi makes me very comfortable. You know you'il do a good job when you trust the person at the monitor. I once took part in a German movie and I don't know German... (Laughs) And I took the role with a German trial shot. I listened, wrote phonetically and memorized it. I love taking parts in international affairs. I was also involved in an Iranian film before this movie. I pretended to know the language - I didn't know again. (Laughing again) I think really acting is a very nice job in this sense as personal development is a necessity to heal in acting. So unless you personally develop, you will not develop as an actor. I think you'll go along on the same plane. I have a sister who is five and a half years younger than me. In my childhood at home I wasn't allowed to do anything. After primary school, we moved from Yalova to Istanbul. I grew up with a dominant mother character. I'm talking about a mother filling out my university preference form. I couldn't even participate in the normal game processes of my friends. So the day my brother came, it was my feast - my play was with my new friend. My mother is a woman with very high ideals. Course achievement was very important to her. From the fourth grade of primary school, I entered the period for exams - I had a childhood full of text book questions. I had gained a lot of weight because I didn't move. When I was 18, I started looking at how to get my head out and started an internship at CNN. It was something that my mother deemed appropriate. Nutrition is very important to me. All sports instructors say that 80 percent of being in good shape is nutrition, and 20 percent of it is in action. I had an illness that I wanted to solve without any drugs. I changed my diet and from that moment I was really cured. I completely removed gluten from my life. Functional feeding. "How can you not eat this pastry?" my mother would say. Any pie for me isn't any better than the mood I'm having right now. So I can't put myself backwards for a pie. Tüzünataç explained what she was doing to preserve her beauty. She told InStyle Magazine about the changes she had undergone. You have to look after your skin. The longer you stay with it, the better you will look. I care, clean, care. I also do pilates regularly. I'm trying very hard to protect my physical condition. I do regular pilates. I also go to a private training studio for functional training and I'm dancing. I'm doing this all five days a week. Sports is, of course, very important and so is a proper diet. When you start looking at yourself, you start eating properly. You're uncomfortable when you eat something bad. I don't eat processed food unless I absolutely have to. Slowly I'm sliding towards a vegan diet and I try to eat things that will be good for my body rather than weakening it. I have also acquired habits such as alkaline nutrition, consumption of seeds and preparing my own snacks at home. I used to consume a lot of salt and saw my eyes swell. I don't consume any salt anymore. I don't eat sugary foods either. I like to go and stay somewhere longer than just taking short trips. In different countries, I like to behave as if I was from -there. I'd make incredibly bad jobs of packing my suitcases - not like someone who travels a lot. Doing my luggage is a complete stress factor. I'd like to take everything with me. I make unreasonable choices, and then I have nothing to wear when arrive where I finally go. I always take the same clothes. I am a scavenger!' I can say. (Laughing) I don't want to throw anything away. I'm even holding colorful clothes I can not even wear anymore. I keep my middle school uniform, graduation dress, bundle bows, movie tickets - everything. In my 20's, I thought that people who said "30's are very beautiful" were placing a trauma onto a beautiful woman. Then I see that I'm now stating the same sentence. I thought I was an adult in my 20's, but I wasn't an adult and I wasn't a kid either. It was a -time when I thought I knew everything, but I didn't realize there was much more to learn. The 30's are great - I'm talking to my friends who are now in their 40's, and they say: "Wait, you wait until you are 40." I will believe them this time. I didn't believe in the first case. (Laughing) So it was a very good time for me. "I am the face of a women's ready-to-wear company. I am not allowed to lose weight. I do not eat, I do not drink. I'm trying very hard to protect my body conditioning. I do regular pilates at Baps in Bebek. I also go to a private training studio for functional training. Besides these, Burcu Yuce is a very good friend as well as a very good dancer and I love to work with her dancing. I'm doing it all five days a week. Everyone has a life journey of their own. There was a female figure in my mind that I wanted to be, and I realized that this was doing a great injustice to my problem. Because I made an effort to approach the figure that I idealized, regardless of how I am constantly feeling in the situation. All is going well as I'm coming to the end of a transition. Every change and transition process is a bit challenging because this process does not happen automatically. It takes effort and sometimes you ask yourself, "Do I do this in vain?" and you try to understand. You want to see a result in a concrete way, although you've gone through an abstract change. But it takes a certain amount of time to see its reflection. Now I'm at a time when I see the reflection and I can say that I am at a quite pleasant stage. Tüzünataç was arrested in a drug sting on charges of buying drugs and was sentenced to 1 year and 8 months of imprisonment. The court reduced the punishment to the famous actor to 5 years of probation. During the police investigation a friend called me and invited me to go someplace. The cops said I was invited for a drug deal. I only wanted cigarette papers at the grocery store because I was trying to quit smoking regular cigarettes. I do not deserve this. she said. Tüzünataç testified to police as part of an ongoing operation against drug trafficking that has focused on a number of high-profile actors. Tüzünataç gave her statement to police at Istanbul Police Headquarters as part of an ongoing case in which 52 people, including 28 celebrities, were detained in an operation two weeks ago. A total of 15 detainees were arrested while the rest of them, including celebrities such as Turkish actor Kenan İmirzalıoğlu, Nehir Erdoğan, Engin Altan Düzyatan, Ersin Korkut and Özge Özpirinçci, were released. After her statement, Tüzünağaç was sent to the Forensic Medicine Institute (ATK) for a blood test. It was also reported that Tüzünataç, who was abroad for the past two weeks, would give her testimony to a public prosecutor at Istanbul’s Çağlayan Courthouse after giving the blood test. The court ruled that Berrak Tüzünataç had been using drugs and that she needed medical treatment. Tüzünataç, will now be treated for a drug use by appointing her a specialist, has appealed against this decision. An upper court did reverse the verdict and turned the sentence imposed on Tüzünataç into the suspension of the pronouncement of the judgment. Tüzünataç was tried again at the Istanbul Criminal Court of First Instance. Tüzünataç, in her statement said "I do not accept these accusations, I do not use drugs". But the court sentenced Tüzünataç to 1 year and 8 months imprisonment for drug use and purchase, but reduced that to 5 years probation. The operation commenced eight months ago when the Narcotics Branch Office started monitoring a drug gang that sold drugs at bars in Istanbul’s Beşiktaş and Sarıyer neighborhoods. A large collection of actors, directors, cinema critics and other artists returned to protest the demolition of the historic Emek Movie Theater in the heart of Istanbul’s entertainment district. It was just one week after a similar protest was met with a harsh police response. Tüzünataç was one of the celebrities at this protest. Istanbul police had been severely criticized for using water cannon and tear gas on April 7 against the group, which included renowned artists such as Greek-French director Costa-Gavras, who lent is support as he was in town to receive an award at the 32nd Istanbul Film Festival. Following the intervention, artists decided to organize a new protest today as part of the closing ceremony for the festival. HDN The demonstrators marched to the front of the theater without any incident to demand that the building be preserved. "Emek is public property. It's everyone's property. We don't want it to be demolished or moved somewhere else. This place is a cultural heritage and is beautiful as it is, where she was established,” actress Nürgül Yeşilçay said. Popular faces from Turkish cinema and soap operas, such as Kenan İmirzalıoğlu, Güven Kıraç, Rıza Kocaoğlu and Berrak Tüzünataç, were also among the group. The audience during the closure ceremony also held banners reading "Emek, beautiful where it is." Just a year younger than the Turkish Republic, Emek Movie Theater was built in 1924 and stands as the first of its kind from the republican era. Despite their fabled history, Beyoğlu's long-serving theaters have experienced difficulties in competing with new, big and modern movie theater chains. The investors in the present demolition project are believed to be transforming the building into a shopping mall, but confusion remains whether the movie theater will be moved somewhere else or disappear altogether. Bir Avuç Deniz (A Handful of Sea), written and directed by Leyla Yılmaz, has won the Best Foreign Film Award at the 10th Female Eye Film Festival, in Toronto, Canada. The film, produced in 2011, "because it reflects the selfishness and evil of people with a universal and political language and through the eyes of women." The film will be released in the U.S. and Canada soon. Last month A Handful of Sea won the Best Film Award at the Lighthouse International Film Festival, an independent film festival, in New Jersey. The stars of the film, Berrak Tüzünataç and Engin Altan Düzyatan, also won Best Actress and Best Actor awards at festivals in New York and Los Angeles last year. Tüzünataç attended the Izmir International Fair and at the ceremony held in İzmir Art Center, she and Engin Günaydın were awarded the "Achievement Award" for the players Suna Selen and Tamer Levent. Tüzünataç said it was very enjoyable to feel that she was part of such a fine arts tradition. Inna Zobova is a fashion model and actress residing in Paris and is the designer of her own line of exquisite scarves. Her unique visual design signature is based on drawings, mixed media and photography. 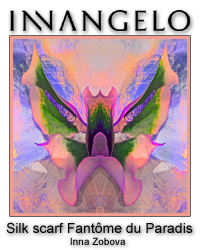 INNANGELO's scarf collections are crafted by Ratti. This prestigious company was founded by Antonio Ratti in 1945 on Lake Como in Italy and is one of the biggest luxury textile manufacturers in the world. The Ratti name is a symbol of resolutely ambitious quality in the world of luxury. Click on the image above and look at Inna Zobova's designs.